Because she not only was she given the wrong boarding pass, she was put on the wrong plane and the wrong airline – but did end up in the right city. The 34 year old's Hong Kong boyfriend had booked her on a flight from Taipei to Hong Kong, but being an inexperienced flyer she went to the check-in counter of Cathay Pacific (CX) instead of the one she was booked on, Hong Kong Airlines (HX). And somehow the clerk happily accepted her ticket and issued her with a boarding pass in the name of a male passenger with the same surname on the Cathay Pacific flight. Curiously she was then able to pass through Immigration without anyone querying that she was a Ms travelling on a ticket in the name of a Mr, waited in the wrong airline's passenger holding area, and was checked onto the wrong plane of the wrong airline by yet another clerk who also did not pick-up that she was a Ms on a Mr ticket. And because she arrived in Hong Kong at roughly the same time she would have on the Hong Kong Airlines flight she was supposed to be on, her boyfriend had no idea of what she had done… until HX called him to say his girlfriend had been a no-show and thus missed her flight. To their surprise he told them that she was in fact standing right next to him then and there in Hong Kong. 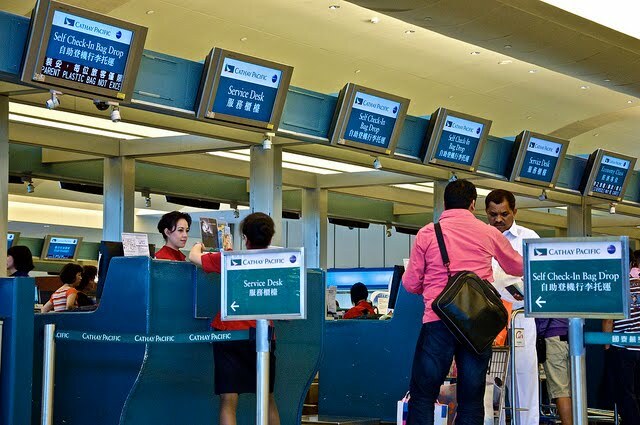 Now both airlines and Taipei Immigration authorities are investigating how the lady could have got through Immigration and flown on the wrong ticket and wrong airline with so many discrepancies in her documentation – and wondering just what happened to the Mr on whose boarding pass she had made her flight. Cathay Pacific and Hong Kong Airlines worked together to ensure the Taiwanese resident made a safe return trip, and she was even granted use of Cathay's executive lounge.